This period marks a turning point in South African history when the discovery of diamonds at Kimberly and of gold on the Witwatersrand spurred the industrialisation and urbanisation of the previously largely agrarian economy. The Union of South Africa is founded through the confederation of four previously separate British colonies: Cape Colony, Natal Colony, Transvaal Colony, and Orange River Colony. The Union is under British dominion. The Natives Land Act is passed. This Act permits only seven percent of the total landmass to be owned by Africans. Outside of these “reserves,” Africans are no longer entitled to land in rural areas without approval from the Governor-General. Non-whites move into the freehold townships of Sophiatown, Martindale and Newclare. Poor whites move into the lower-income townships of Brixton, Newlands and Westdene. The Native (Urban Areas) Act is passed. This ordains city authorities to enforce residential segregation to prevent miscegenation. The influx control provisions of the 1923 Act are not widely applied and the urban African population increases substantially by the later 1930s. Amendments are made during this time to encourage stricter application of the Act. The Native Trust and Land Act is passed. African reserves are increased to 13.7 percent of the country’s total landmass. This increase in land is couched in a desire to encourage Africans out of urban areas rather than the intention of improving African livelihoods through granting them more land. World War Two occurs. Africans comprise a significant portion of the war effort. As a result of more Africans in the factories, influx controls are relaxed. Unrest regarding the predominance of Africans in Johannesburg urban areas stirs among officials and White communities. This results in the proposal by the Johannesburg City Council to remove all Africans and Coloureds from Sophiatown. Influx controls start to be applied more severely. A proposal is made to give influx control offenders employment on farms due the shortage of labour there. The Nationalist Party is elected to power. Hendrik Verwoerd is made Minister of Native Affairs. W.M. Eiselen is made Secretary of Native Affairs. Six apartheid laws are passed: the Group Areas Act (1950), the Stock Limitation Act (1950), the Suppression of Communism Act (1950), the Separate Representation of Voters Act (1951), the Bantu Authorities Act (1951), and the Natives Abolition of Passes and Coordination of Documents Act (1952). The new Administration appoints a provisional Resettlement Board to supervise the removal of Africans from the Western Areas to Meadowlands. The “Defiance Campaign” against the six apartheid laws begins. 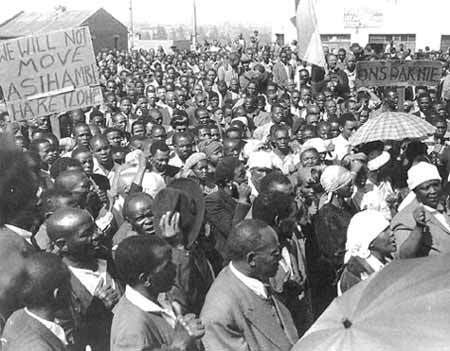 The African Anti-expropriation Ratepayers’ Association protests the 1952 resettlement plans in a memorandum. This document targets the non-consultation of the Government with the residents to be affected by the removals and the plan to relocate communities from an area with facilities to one without. A conference is called by the South African Institute of Race Relations. A representative of the Government is invited, but does not attend. Outraged, the JCC resolves a policy of non-cooperation with the federal government vis-Á -vis the removals scheme. The federal government responds to this act of defiance by the JCC by creating the Native Resettlement Board, an administrative body, which usurps the power of the JCC. The Native Resettlement Act is passed. This legalises the removals scheme. On 9 February 1955, the removals begin in Sophiatown. The army moves 150 families on the first day. 60 000 Africans are evicted from the Western Areas. 465 000 Africans throughout the country are forcibly removed from their homes. Officials and soldiers face strong resistance from African and other residents. This article was written by Honor Lay and forms part of the SAHO Public History Internship.